The football season is now underway, and the weather is already beginning to take a turn. Training is always tough at this time of year, so we believe that it is very important to keep the moral of your football team high whilst the temperature is low. As we’re sure you’ll agree, looking after your players is the number one priority. This means staying warm and dry whenever possible is absolutely necessary. Considering the amount of rainfall we have here in sunny England, it is still surprising how many kids turn up to football training without waterproof jackets. Here at Pendle Sportswear, we want to be sure that the rain doesn’t dampen the mood. We know that good quality training wear can make a huge impact on a player’s performance. To help you out we have made a list of our top 4 wet weather training essentials, to make sure your football team is prepared for all possibilities. We know that you can’t always rely on the weather, but you can rely on a Pendle waterproof to protect you from it. At this time of year a good quality, light weight jacket will be one of your most important pieces of kit. Our Santiago Rainsuit is a great performer. This half-zip, pull over jacket is available in 9 different colours and starts at only £13.99. The beginning of a training session can be the toughest part. It’s never too easy to get your team running about on a cold and wet October day, but once they do, they’ll soon warm up. Layering is the key to keeping warm and we advise 2 or 3 thinner layers. This means that once you begin to get the blood pumping, you can always easily remove a layer if you’re too hot. A Pendle Base layer is ideal for layering. From only £6.00 it’s a wardrobe essential for any training athlete. Our tight fitting base layer is perfect to wear under any football shirt or training top. It’s lightweight and highly stretchable fabric will keep you comfortable no matter how active you get. They are also made with moisture-wicking Qwick Dry fabric, engineered to draw the sweat away from the skin, keeping you cool and dry. Adding a suitable pair of tracksuit bottoms to your kit list is the next step. Our Atlanta tracksuit bottoms, from only £9.99 are a popular addition to this year’s training wear range. These are a slim fitting jogger perfect for any training session, and great for layering over your shorts. These tracksuit bottoms have been designed for optimised comfort and performance. The slim fit avoids any excess material around the ankle, and allows for greater and more streamlined movement. Once you are warmed up and well into the session, the bottoms can also be easily removed. Ankle zips make them a breeze to take on and off without removing your football boots, letting your training session go on undisturbed. Use your head! 10% of body heat can be lost through the head. A woolly hat is a simple yet effective piece of training wear that can make a great difference. It keeps your players warm and it keeps their heads dry, which also stops the rain from running down their faces and into their eyes. Aside from the practicality of these woolly hats, they also make your team look very professional. Our hats cost only £6.25 each and can be personalised with an embroidered club badge or name for FREE! But why stop there? Don’t just kit your team out! If you have die – hard supporters who show up weekend after weekend, no matter what the weather brings, then why not make your hats available for them to buy, through your very own online club shop. Club merchandise can make a great gift and can also be an essential fundraiser for any club. If you found this helpful and would like to see more of our products, please visit our website www.footballkit.co.uk. 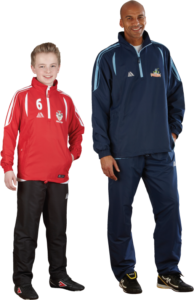 We have loads more great ranges ideal for both football training and match day, with options to suit all budgets. Our items are available in a range of colours, and many can be customised with printing and embroidery. Happy training!